"Obviously coming back here to defend my title, I can't remember how many times I've ridden on this course, I've done well from getting a lead out and coming from behind." 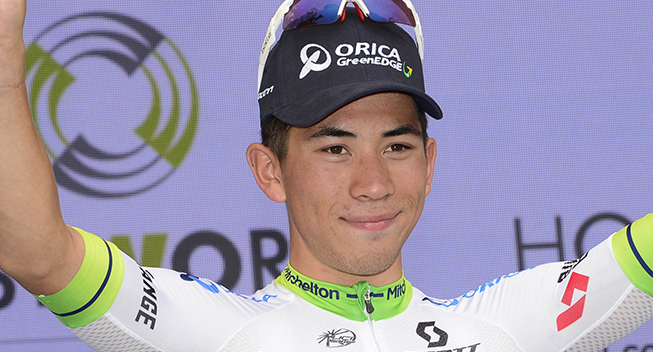 Pocket rocket Caleb Ewan (NSW) timed his sprint to perfection to successfully defend his elite men's criterium national title at the 2017 MARS Cycling Australia Road National Championships in Ballarat. Earlier in the day, Perth's Jessica Allen won the elite women's criterium crown, while Adelaide's reigning track world champion Alex Porter powered to maiden road title in the under 23 event. It was a brilliant display from Ewan's Orica-Scott teammates who protected him throughout the race leaving him fresh to pounce in the final uphill run to the line, hitting out early and leaving his rivals in his wake. 22-year-old Ewan held off former track sprinter and World and Commonwealth Champion Scott Sunderland (WA) and Brenton Jones (VIC) who found the podium for the third time in four years. The race was dominated by a nine rider move initiated by Nathan Earle (TAS) who was joined by Jesse Featonby (NSW), Joshua Taylor (NSW), Sam Spokes (NSW), Travis Meyer(WA), Ben Hill (ACT), Cameron Ivory (NSW), Mitch Docker (VIC) and Sam Crome (VIC). As the laps counted down Orica-Scott steadily whittled down the advantage of the break to eight seconds with two laps to go, before a series of attacks from the peloton saw the race back together heading in to the final straight. In a drag race to the line, Ewan unleashed his speed to cross the line with his hands in the air, with the top 10 a who's who of Australian sprinting including former champion Steele von Hoff (fourth) and former under 23 champions Jesse Kerrison (fifth) and Scott Law (tenth). "It is pretty hard, obviously, the expectation coming into it," Ewan said of defending his title. "I think I came in here probably as the favourite, probably a pretty close favourite as a lot of the guys have been sprinting really well. "It was always going to be hard with only two guys to help me but probably the two strongest guys in the race fortunately for me and they covered everything perfectly and all I had to do was sit there and relax." The victory was Ewan's third on the course after he claimed a crown in the under 23 category in 2014 , with his experience proving vital when tested in the later stages of today's race. "Obviously coming back here to defend my title, I can't remember how many times I've ridden on this course, I've done well from getting a lead out and coming from behind," Ewan added. "So I think when I got boxed off the wheel in the last corner, I didn't panic too much. If I didn't have the confidence I think I would have panicked and waited too late for my sprint." Bronze medallist Brenton Jones was eager to take positives from his rivalry with Ewan. "One thing that we go into every race [is] trying to find ways to beat him I guess, he is a classy bike rider. "He has won World Tour stages, he knows how to win big races. I think it is awesome for us as guys trying to beat him, to gain experience from him, learn from him, race against him," Jones added of the competition boosting Australian sprinting. "I think we are only going to get better ourselves. I had a nice little cheeky win on the stage tour of the Bay Crits, I overpowered him there."